Together, we’ll create a place you’re proud to call home. We help homeowners create spaces that bring them joy, from DIY consultations to full landscape design and installation. We work with businesses throughout Portland. From creating inviting environments around apartment buildings to designing patio container gardens and other landscaping for offices and commercial buildings. Sticks & Stones is a resource for a wide range of projects. We consult with people in all stages of DIY projects, from helping clarify your vision to answering your logistical questions. Two neighbors get a functional, beautiful parking strip solution. Installation of a retaining wall, basalt pathway and plantings transformed a muddy grass slope into an aesthetically pleasing area that both neighbors love. A newly built Bend home gets a high desert landscape. Taking inspiration from the stony landscape of Central Oregon’s high desert, we designed a dry riverbed in the sloped front entry and a stone walkway to connect the front porch to the backyard, then filled the space with native plants. An updated front yard breathes new life into a historic home. 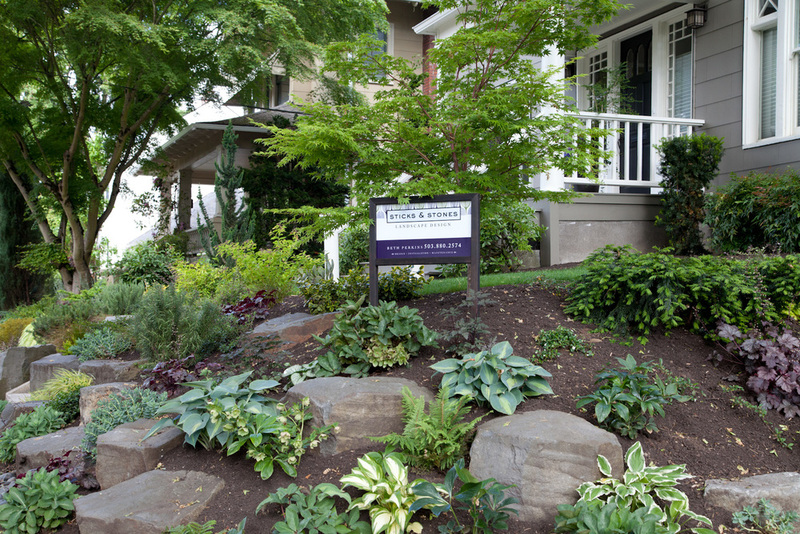 A basalt boulder installation and classic plantings transformed the sloped juniper hedge to create a more welcoming home in this historic Irvington neighborhood. A triplex receives a much needed facelift. A sloped lawn transformed into a basalt rock garden. Arid plantings, friendly walkways and mid-century modern details.